"Show me again the power of the darkness, and I'll let nothing stand in our way." Sideshow is pleased to introduce the first Premium Format™ Figure from the blockbuster film - Star Wars: The Force Awakens - Kylo Ren! This museum quality reproduction of the powerful and hot-headed leader of the Dark Side depicts Kylo Ren with feet firmly planted, and an outstretched hand grasping at the tendrils of the Force. 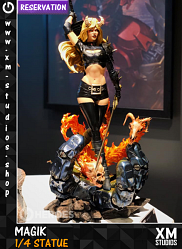 Masterfully crafted with an expertly tailored costume and his signature crossguard lightsaber, this statue captures the raw emotion often displayed by this knight of the Dark Side. Masterfully crafted with an expertly tailored costume, his robes are handmade using an eight pass printing process to develop the screen accurate textured pattern. They also feature wires running through key points so that the drape and flow can be customized to the collector's preference. 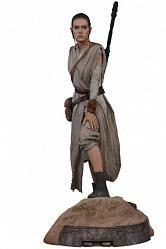 and his signature crossguard lightsaber, this statue captures the raw emotion often displayed by this knight of the Dark Side. 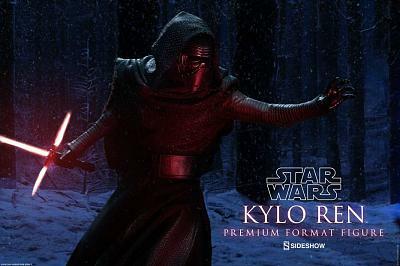 Our Kylo Ren Premium Format™ Figure also includes his signature crossguard lightsaber and captures the raw emotion often displayed by this knight of the Dark Side.